Was Tolkien trying to reveal something about absolute power in his epic writings, The Lord of the Rings and The Hobbit? Something maybe even predictive about where the world is headed many years later? Thus the only sensible solution is to destroy it. One might ask, is not the current “power” direction essentially one first of all of deceit via much propaganda? Consequently, it may be said, “One ring to fool them all, before we rule them all.” Are we seeing a convergence of many major world powers and potentates, all vying for the position of being the “ring master” (head of the circus?) who rules them all. Who are the players? What do they really represent on the world stage? What’s the agenda here? These are questions we should all be asking, and then keeping our eyes up and being alert. Power corrupts. Absolute power corrupts absolutely. Men are corrupt in their hearts, and power over others can have an intoxicating effect. What puzzles me is that, when these films first came out, strung across several years, many people were practically idolizing this ring although its inscription is a dark one, purchasing models of it, and wearing it on their persons. These were not all children or young people, but adults as well! People who say they do not stand for tyranny. Yet they were quite willing to wear something that symbolized it. Why would anyone even want to identify with an oppressive idea like that, unless the idea itself found a place to hook into them? I’d like to think it was because they wanted to identify with the quest of destroying it in Mount Doom. But I tend to be a bit skeptical of human trendiness. Food for thought. Indeed, “One ring to fool them all, before we rule them all.” And how easily we can be fooled. It is so much easier to present a pretty idea without the messiness of firing a shot, or starting wars where possible - if people can first be charmed into submission, and compliance with dominance can be achieved with flattering speeches, empty promises, and trinkets. Take a really good hard look at what’s going on in the world, an honest one. Look at trendy trends, like the foregoing. What precipitates them? What’s unfolding across the world afterwards? Were we warned, threatened? What effects are they subtly planting in people’s noggins, these lovely little fads? We know that Hollywood is a propaganda mill, and that much coming out of it is perfectly timed, very calculated, and not by accident. My thought on it is that we were given a message packaged as entertainment, when it may well be calculated entrainment. The ring represents a very alluring but dark idea, pulling along many into its vortex - if they have little discernment or ability to view entertainment with a critical eye. Good stories aren’t written with no point to them other than to “entertain” people. Especially with the effort put into the creation of this story, as well as its film follow-ups. Perhaps thinking and analysis don’t rate very highly on the list as ways we can be entertained. 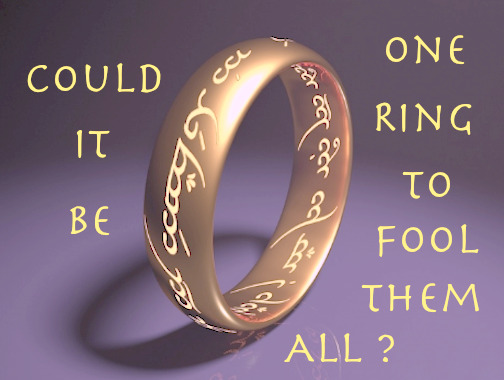 When it’s all about thrills and feelings and purchasing rings with darkly occult messages on them to amuse ourselves, then we may have already marked ourselves as easy targets for those who seek absolute power: the one ring to first fool them all, before it is revealed as the one ring to rule them all.